Update 7/9/18: Google has announced that the latest Android Emulator release now supports Windows 10 PCs with AMD processors and Microsoft Hyper-V. The original story is below. Android Emulator 27.3.6 was recently released in the Canary and Dev channels alongside the Android Studio release, bringing a long-awaited feature for AMD users on Windows 10. This new build has finally brought support for running the emulator with hardware acceleration on machines with AMD processors. Previously, AMD users on Windows 10 were unable to run the Android Emulator with hardware acceleration, which resulted in the emulator running slow, inefficiently, and just generally being frustrating to use as compared to the experience on the Intel platform. 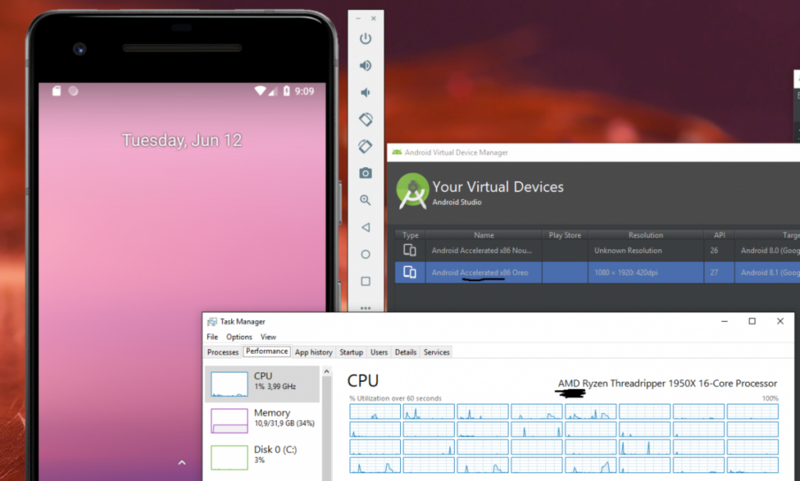 Android Studio Emulator Developer /u/lfy_google also clarified that hardware acceleration should work on Windows 10 Home systems as well, despite the latter not having a “Hyper-V” option. Just enabling the “Windows Hypervisor Platform” option in Windows Optional Features should do the trick. Furthermore, support for API 25 and below is not yet included; users can expect to see this fixed in the next canary build.